The London based news source Metro recently featured Drinkwel in their “Life & Style” section as a healthy hangover cure. Below is a snippet from the featured article “Why most of us are probably drinking too much for our health”. 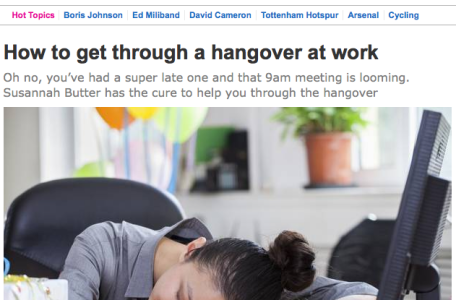 Alcohol Concern say around 200,000 people come to work with a hangover every day. So we’ve tested the latest hangover cures to stop you reaching for a hair of the dog. 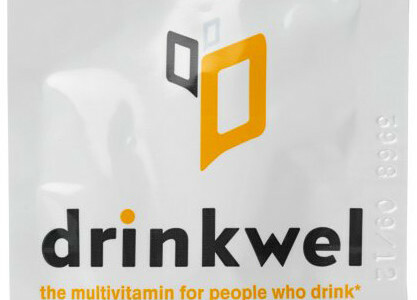 The premise of DrinkWel tablets is simple. Dubbed the world’s first multivitamin for drinkers, it a combination of ingredients to replenish nutrients, support healthy liver function, and help your body process alcohol-induced toxins. All you need to do is to take three capsules with water before going to bed and while that might sound on the excessive side, the benefits are worthwhile. Despite being slightly dubious, I definitely noticed a difference the following day. The feeling of dehydration that often comes along with an evening of overindulgence was noticeably absent and my mind felt clear and fresh.The only thing worth noting is that it is that it had a positive impact based on me consuming three large glasses of wine. Whether it would be as effective if I had had more remains to be seen. – Naomi Mdudu. You can read the full Metro article online here. We all know there is nothing worse than that feeling of being hungover at work! 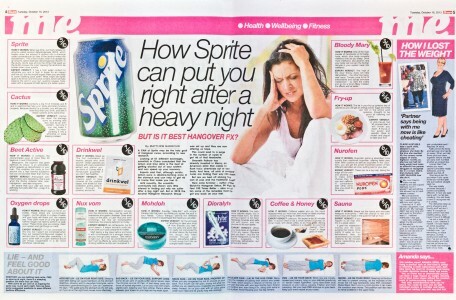 The London Evening Standard recently featured Drinkwel as a helpful cure to get you through the dreadful hangover and back to having a productive day at work. “There are also supplements available for “healthy people who drink”. Drinkwel is £39.99 for a month’s supply (you’ve got to commit to a month of partying) with 33 ingredients and a claim that replacing depleted minerals and vitamins will help. If all else fails, our cocktail columnist Richard Godwin suggests his (patented) Sun and Moon cure – Berocca and Alka Seltzer XS in the same glass. Caffeinated paracetamol is also popular, washed down with sugary full-fat Coca-Cola. Sofeminine.co.uk a women’s health, beauty, relationships, TV, food & drink and general lifestyle website with a readership of 558,000 recently featured the Drinkwel pill as one of the best products to prevent a hangover. As discussed in the feature, Drinkwel contains all the antioxidants, vitamins, minerals, and amino acids your body needs to prevent a mean hangover! 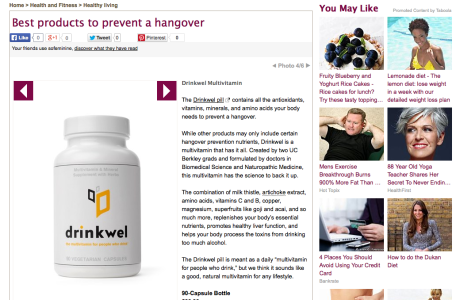 The feature goes on to discussing what sets Drinkwel apart from all the other hangover products; “While other products may only include certain hangover prevention nutrients, Drinkwel is a multivitamin that has it all.” The Drinkwel pill is meant as a daily “multivitamin for people who drink,” but we think it sounds like a good, natural multivitamin for any lifestyle! The Sun, the UK’s largest newspaper, recently released a feature investigating various remedies for the festive drinking season. Expert, Jane Scrivner, author of “The Quick-fix Hangover Detox: 99 Ways To Feel 100 Times Better” rates drinkwel a 9 out of 10 for best hangover fix! If you are a Sun online member please use the link below to find the online article! Jane looks at several potential remedies for a heavy night out, rating each on a 1-10 scale. Some of which include; Sprite, Bloody Marys, Cactus, Beet Active, Dioralyte, Nurofen & of course drinkwel. drinkwel was the highest on the scale with a 9 out 10 score! 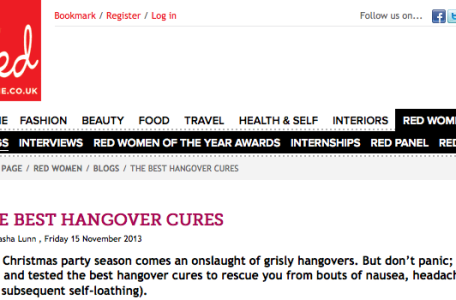 Red Online, top beauty and fashion magazine, recently released a feature investigating various hangover cures for a big night out with friends. Red’s deputy chief editor sub, Terry Barbrook, put drinkwel to the ultimate test, having 10 pints(plus 3 shots). After that colossal night out, Terry rated the severity of his hangover a 1 out 5…..noting the preventative benefits of drinkwel. Despite his worst fears of hanger, he was able to run his normal Sunday errands at nearly full strength. Cheers to you Terry for trialling the product and giving a full go of it! If you’ve got a heavy festive season, make sure to try some drinkwel.